You're in the midst of taking NYSTCE Multi-Subject practice tests. Your reading your NYSTCE study guides when suddenly, it hits. Your NYSTCE Multi-Subject study guides start to blur together, and you can't seem to focus. Your heart starts palpitating. Your palms become increasingly sweaty, and your breathing becomes heavy and ragged, as if you've just run a marathon. It's official: you're having a panic attack. And it’s all about getting a failing or passing NYSTCE score. …The fear of the unknown. The following Multi-Subject practice advice is dedicated to the unique challenges of this specific exam. 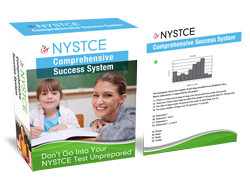 However, thousands of test takers leveraged this info to pass the NYSTCE Educating All Students (EAS), Academic Literacy Skills Test, Mathematics, Elementary and Secondary Assessment of Teaching Skills, Communication and Quantitative Skills Test and others. Use the NYSTCE Multiple-Subject safety net as an option of last resort. It’s nice the safety net is there as a back-up, but that route can lead to a lot more test preparation expenses, paying hundreds more in testing fees and postpone your teaching career due to failed exam attempts. While it's easy to identify what's causing those tumultuous nerves, it's not so easy trying to talk yourself down from them. After all, how can you reassure yourself that you'll do well on the exam when you're not even sure of what's going to be on it? However, the key is approaching your test nerves from a physical standpoint – and not a mental one. Where the Body Goes, the NYSTCE Multi Subject Practice Brain Will Follow! It's an idea that you won't find in those EAS review materials – because these test experts have been the first to reveal this innovative concept to test prep students across the country. “There's plenty of research to suggest that the mind influences how the body feels,” says Carl Lam, a NYSTCE exam study guide author. “That's why you're experiencing the test stress in the first place. …We can just use the following isometric exercises to stop it in its tracks! If your concentration is starting to wander away from your NYSTCE Multi Subject, then use the following exercise to get back on track. Press your palms together as hard as you can for just a few seconds. Take note of the tension you feel running all of the way up through your arms and into your shoulders. Now release – notice the relaxing sensation you're feeling? That's the feeling of test stress melting away from your muscles and mind! Is your mind buzzing with panic? Calm it down by performing this yoga stretch: sit cross-legged on the floor, with your hands gently resting in your lap. Slowly rotate your head from your left side to your right and look over each shoulder as much as you can. Pay attention to how good that stretch feels – now repeat five times on each side, and you'll be amazed at how quiet and still your mind becomes.